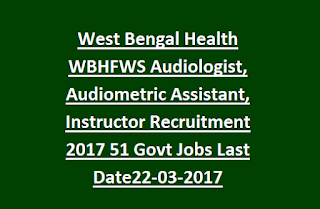 WBH & FWS Audiologist Recruitment 2017: West Bengal State Health & Family Welfare Samiti WBHFWS, Kolkata has given recruitment notification for Audiologist, Audiometric Assistant, Instructor posts for the young Impaired Children under NPPCD Programme. There are total 51 vacancies available in this WBHFWS Recruitment. Eligible candidates are suggested to apply online on or before 22/03/2017 through online West Bengal Health WBHFWS official website. Online application starts from 22-February-2017. This WBHFWS Audiologist recruitment will be conducted through Academic qualifications and Interview. 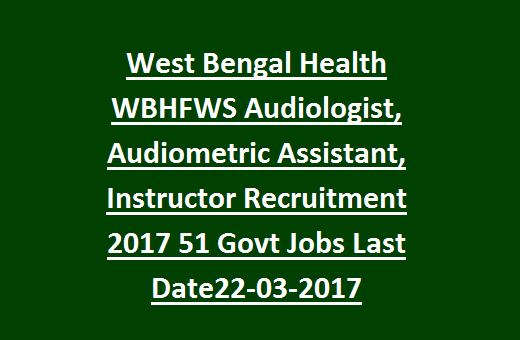 Available vacancies, Educational qualifications, pay scale, Age details of West Bengal State Health & Family Welfare Samiti WBHFWS Audiologist recruitment examination notification are given below. 2. Audiometric Assistant: 20 Posts. Pay Scale for the post Audiologist is Rs. 30,000/-. For Audiometric Assistant, Instructor posts is Rs. 15,000/-. Audiologist: Candidates must have qualified Bachelor degree in Audiology & Speech language Pathology and/ or BSC (Speech & Hearing) from the RCI recognized Institute. Audiometric Assistant: Candidates must have qualified one year Diploma in Hearing, language and Speech (DHLS) from RCI recognized Institute. Instructor: Candidate must have completed Diploma in Training young Deaf & Hearing handicapped (DTYDHH) from RCI recognized institute. Age limit for the Audiologist is 22 years to 40 years. For other posts is 19 years to 40 years. Age relaxation will be given as per Government rules. Selection for this WBSHFWS Audiologist recruitment will be held based on Academic qualifications, experience and Interview. -Graduation in Audiology & Speech language Pathology and/ or BSC (Speech & Hearing): 20 marks. Diploma in DHLS/ DTYDHH: 20 marks. For more detail see the official notification. Application fee for all candidates is Rs.100/- through Demand Draft in favor of WBHFWS payable at Service Brach, Kolkata. Eligible candidates have to apply online through the official website of West Bengal State Health and Family Welfare Samiti. Before applying read the official notification for general instructions. After completion of filling the application through online upload scanned copy of passport size photograph and signature. Online application process starts from 22nd-February-2017 to 22-March-2017. After successful submission take the print out copy of online applications and fee demand draft send to the following address before 29-March-2017 through post. HR Cell, 1st floor, GTZ building, Swasthya Bhawan, GN-29, Sector- V, Bidhannagar, Kolkata- 700091.